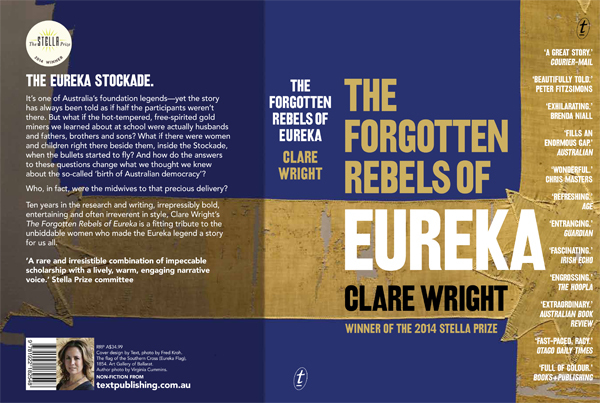 Congratulations to Clare Wright for winning The Stella Prize 2014 for ‘The Forgotten Rebels of Eureka’ (Text Publishing). To celebrate this exciting news Text Publishing will release a stunning new trade paperback edition of the book featuring the prestigious Stella Prize logo. Clare Wright offers a genuinely new historical perspective on Eureka. Traditionally represented as a key moment in the forging of Australian masculinity, the conflict and the events that led up to it involved a number of women, both directly and indirectly. Far from the usual image of a wild shantytown with an all-male population, the book reveals a relatively ordered goldfields society where commerce, domestic life and even theatre all flourished. The book makes extensive use of contemporary newspapers and journals, whose advertising reveals a thriving female culture: dances and balls where childcare was provided, and breast pumps for nursing mothers. It also makes use of private journals and letters, which are always a productive and revealing source of information about the people who usually get written out of the official records and histories. Clare Wright does not attempt to discredit existing versions of events, but rather to enrich and deepen our knowledge of Eureka and our understanding of its place in Australian history and society. Clare Wright is a historian who has worked as a political speechwriter, university lecturer, historical consultant, and radio and television broadcaster. Her first book, Beyond the Ladies Lounge: Australia’s Female Publicans, garnered both critical and popular acclaim. She researched, wrote and presented the ABC television documentary ‘Utopia Girls’ and is currently writing a four-part series to commemorate the centenary of WWI, “The War That Changed Us” will screen on ABC1 in late 2014. She lives in Melbourne with her husband and three children.